TEMPERATURE : -40°F to +200°F (-40°C to +93°C) continuous service. Reference page 6 for additional information. 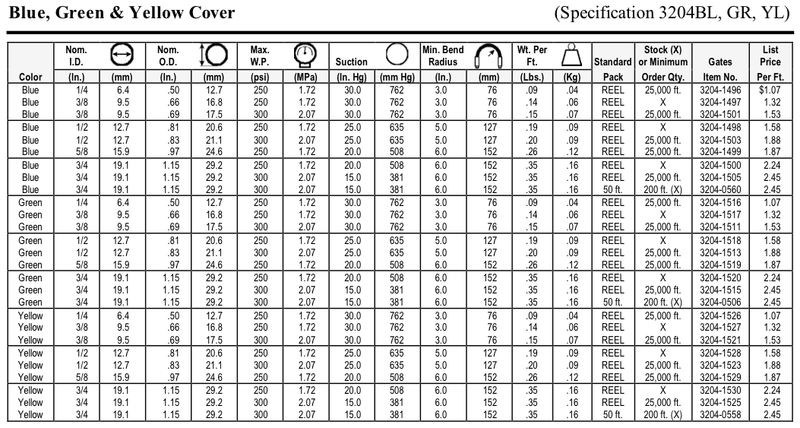 Cover: Type P (EPDM). Blue, Green or Yellow. All sizes through 1/2″ are perforated. COUPLINGS:  (up through 1/2″ only),  ,  or  (up through 1/2″ with 20 brass ferrules, up through 1″ with bands) or 72 Gates permanent Power Crimp® couplings. 3/8″ through 3/4″: Packaged in 500′ to 700′ reels. Maximum 2 pieces in 50′ increments. 3/4″ x 50′: Packaged 200′ per carton, each length coiled and tied. STANDARDS: Tube: RMA (Class C) Limited oil resistance.